As some of you know two weeks ago I had my tooth extracted. It was infected and had been bothering me slightly for nearly a year. Since the tooth was removed I have felt “myself” once again and more awake in mind and body. Around a year ago or more, I noticed that I always chewed on the right side of my mouth. Shortly after I started to feel the tooth, and had to switch to chewing food on the other side of my mouth. I felt lead to ask for the Universe to heal me, and thus I did not seek out traditional Western treatment. I trusted early on that some alternative healing process would come along, but then with my crazy busy life at school I think I lost that belief. The slight pain would only occur when I chewed on it and would come and go, so I didn’t pay very much attention to it until a month ago. It started to hurt more, especially when I would lie down and rest. I knew I had to see a dentist. Three Thursdays ago (9/29) I saw the first dentist and so began a saga. He told me to go and get it pulled immediately and put me on penicillin. As chance had it I was not able to make it from Greenfield to Springfield in the hour and a half time frame I was given. This is good, because other dentists have told me that it would have been excruciating, although that night was extremely painful. The next morning I felt better, because the antibiotics were working, and Alice drove me for an early appointment with an oral surgeon in Brattleboro, where I was going to have an examination and potential extraction. The dentist was very pompous and told me to wait the weekend and think about whether I should get a root canal instead, I knew I did not want a root canal, but was unable to tell him that in the moment. It was a lesson, in learning when to speak. However, it also ended up being a gift because I did consider a root canal. A family friend told me about biological dentistry, and the root canals that they perform are much safer and cleaner in the long run. Biological dentistry is kind of like organic food, if one were to compare the two. Then we found a wonderful biological dentist practice called Groton Wellness, in Groton, MA, an hour and fifteen minutes away. They were very nice and explained why even they do not do root canals, because there is no way to keep out bacteria from a dead porous thing – so we took it out. To sum it up, I am so thankful for the way things worked out, as they did for the best. I am ready to be and continue doing what I truly want to be doing and what makes me feel alive. I have learned to listen to my body. And after the whole experience, another lesson was that I wanted the Universe (God, greater power, Creator, etc.) to heal me and then it did. It was in that dentist, and I was excluding dentistry as being part of our Universe when it truly is. This has lead me to reflect on: Are you living your truth? And if not, you can begin living that truth now or wait (like me) until the Universe “puts you through it” to make you realize. I say, let’s live it now! Life has been so hectic lately that we have not written in a long time. Our apologies. We write you now to share some recent reflections and give an update about how this project is going. The last month has been full of visitors. Friends of ours coming to see the farm and camp out with us for a few days here and there, and a lovely visit from Alice’s mom. In the midst of all the visiting we’ve still been working, often with our guests. We have uncovered more ground for our fall planting, some extra greens, and more root vegetables. We’ve also been, I’ll be it slowly, working on our hoogel (a permaculture technique that involves building a mound out of dead wood). The drought continues on. Thankfully we have a very deep well which continues to provide water. However, it is so dry, and we are watering by hand- so nothing ever gets watered very deeply, that we have to water usually every day. Watering takes us several hours. We say that our watering just keeps everything alive, but that it seems like it doesn’t really grow unless it rains, and then bursts! The point is between the time spent watering and the time spent harvesting on days we have market or CSA shares, we make very slow progress on our longer term projects. This is a frustrating reality both of climate change induced drought, but also of homesteading. When you’re living on the land, the chores and tasks will never end, and you can never predict what will come up! We are now in preparation mode for colder weather. Acquiring more wood for heating and cooking, looking for the right wood-stove for our canvas tent, looking for a canvas tent, and considering building materials for a tent platform. We are also attempting to work on the enclosed “kitchen trailer” which has been lent to us by a resident of Woolman Hill, a tiny kitchen build on a small trailer bed which we can cook in this fall during rain or shine. Needless to say there is a lot going on! More to come. Today we spent the afternoon with a Friend from Mt. Toby, Stephen, who was lending us a hand and use of his truck, to pick up fire wood from the house of another Friend. It is clear in these moments the ways the web of the Quaker community is supporting us. The afternoon was full of slow, meditative work, and thought provoking conversation which both of us will continue to reflect upon in the weeks to come. At the end of the day we were standing back at the farm talking after we’d finished staking wood. As our conversation progressed we would here gun shots every few minutes. There is a shooting range just over the ridge from us, and so it common that our days working in the fields are punctuated with the sound of, at times incessant, gun-fire. We recounted to Stephen how a womxn Alice leads Non-Violence trainings with said once while visiting the farm to work on a training agenda, that the gun fire is a good reminder to us. Our understanding of her comment is that the gun-fire is a good reminder that gun violence is happening within this country and around the world ALL the Time, and a good reminder of why we are here doing what we are doing. And it is this interesting juxtaposition that we are reflecting on and wish to share with you. Here we are on Quaker land (Quakers having a deep history of Non-Violent resistance and pacifism), on a War-Tax resistance homestead, in the space of the Nelsons whose lives were dedicated to Non-Violence, and . . . our neighbor is a gun club. And we must Love them. Last Saturday, 6 August, we were graced with visitors from The New England Peace Pagoda. One Sister, one Monk, and a handful of others involved with the Peace Pagoda stopped by Woolman Hill for lunch as a stop on their 2016 Hiroshima-Nagasaki Commemoration Walk. They came up to the Hill because the building now known as “The brown house” was formerly Traprock Peace Center. The house, previously Traprock bellow and Peace Brigades International above, is now a split level, housing residence of the Hill. Mira, who lives in the lower story of the house knew some of the folks from the Pagoda and hosted a lovely lunch in her living room. It was a pleasure for us to spend time with the walkers, provide some veggies from our gardens, and an important moment on the anniversary of the U.S bombing of Japanese cities, Hiroshima and Nagasaki, to reflect on the role of nuclear weapons in the world today. The Peace Pagoda Walkers brought with them a petition to the leaders of the world to be signed by citizens of the world. It was written by the survivors of Hiroshima-Nagasaki calling for complete eradication of nuclear weapons anywhere. We acknowledged over our lunch together that although the Nuclear Freeze Movement of the 1980’s, born in the very living room we were sitting in, is in many ways considered a success, nuclear weapons persist in the world today. In fact, the U.S Congress has been busy re-evaluating the nuclear arms deal recently made with Iran which came to pass through very skillful negotiation, and without physical violence. However, if picked apart could result in more conflict and strife. We were reminded that although the national narrative seems to be that nuclear weapons are a thing of the Cold War Era, they are in fact, just as present today as they were in the 1980’s. The visit with the walkers reminded us exactly why the Nelson’s lived as they did, and what it is we are carrying forward: divesting from a war/violence economy which thrives on the production of weapons- nuclear or not. We encourage readers to follow the link above with details about the Peace Pagoda Hiroshima-Nagasaki Walk. We’d like to say a few words on “comfort.” These thoughts in this post have been swirling around inside us for some time now, not getting the time they deserve to come out on paper. Throughout the course of our time here, we have noticed that many people are emotionally/intellectually uncomfortable with the idea of our physical discomfort. We are not “roughing it!” Well, certainly by middle and upper class U.S. standards we are, but we feel life around the Bean Patch is going smoothly. Although life may be chaotic, it is not rough. Two weeks ago, I (Alice) was with my Uncle and Aunt at a Quaker gathering. I was explaining this witness/project to them, and shared that many of our family, friends, and community members express well-intentioned and loving concern. I told them that I am more comfortable now than I have ever been, because although certain physical tasks may be “harder,” and the simple doings of life may be “harder”; my heart and soul are at ease. This ease comes from a knowledge that my lifestyle is not buying into (literally) systems of injustice, which I am very UNcomfortable with. At The Bean Patch we often say, “We are not roughing it!” The tasks are “harder” perhaps, than our conditioned sense of “comfort,” but we don’t notice it, for to us this is just living. If you think about it, our life here is still far cushier than the majority of the world’s population. To our society this is “the simple life,” but on a global scale this is simply life. We believe that the term “simple life” is ironic because although computer-chip technology creates more to think about, our daily tasks of life are more complex without basic machinery and appliances. Smart-phones think for us, and appliances do for us. But we find life more enriching by thinking and doing for ourselves. By taking the time to engage in work with our own two hands we become embodied, present in our life, and thus, happier. And of course we are human and have contradictions. We are writing you from a laptop! We do not write this to give our egos a pat on the back. We are both becoming progressively more uncomfortable with the amount we drive (and trying to get more creative). Like Thoreau, we do laundry in a family member’s washing machine, and go to town regularly. 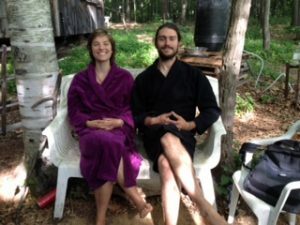 We are attempting to divest from the economy of violence: the military-industrial complex, militarization of the police force, the prison-industrial complex, big agriculture, corporatization, and climate disruption; by learning to live self-sufficiently, and off-grid for the sake of war-tax resistance. However, we are still linked to the system. The human web of connection is what we all depend upon. We have a large network of family and friends who greatly support us. But until our species at large has evolved beyond economies of violence, the two of us are still benefactors of the system, because that is the only web that currently exists. And we wouldn’t want to be without support. Alone we are nothing, and together we are everything. We are blessed to know many creative spiders trying to spin a new web of peace. We were told recently that if we opened ourselves to them, the spirits of Wally and Juanita would teach us a lot. They definitely are! Our F/friend Mary Link told us a story recently in the same vein as Alice’s conversation about comfort with extended family. She told us that when folks would ask Juanita “isn’t it hard to live that way?” She would respond, “It’s harder to think about the person at the other end of the gun I paid for [with tax-dollars].” We are more comfortable “roughing it,” by engaging in life, and slowly learning how to spin the new web . . . besides, how uncomfortable are we really? We have fluffy bathrobes! Well here we are and it’s 10:30pm, we need to get to bed soon as we are trying to adjust from college student- stay up till all hours of the night- to farmer- get up at 5am- schedule. We admit that we’ve been neglecting the blogging part of this adventure. The two of us have been talking lately about how difficult it is to balance all the work that must happen on the land with the type of work that is also necissary to our success such as outreach through the computer. We have been utterly overwelmed by everything there is to do here, and that balance is a hard one to maintain. Our large garden is nearly all planted. Few! However, the medium garden is still in the uncovery proccess. The prior was last worked 10 or more years ago, on that one we had to strip-till using a roto-tiller. However, the medium garden has been in use more recently- left fallow for more like 5 years- so we attempted not to till. In late April as we were busily finishing our finals we lay down cardboard all over the entire field. Now a month and a half later we are ripping it all up. The dead grass certainly makes for easier removal of sod, but doing it all by hand with a hoe is hard work. We’ve been feeling very overwelmed and stressed by the need to get this field ready and planted, as we are already so far behind even in our large field. Over the last few weeks we also established our herb patch- a ten foot in diameter circle planted in the shape of a medicine wheel. An old family friend of Dunan’s- Emma Donnelly- was very generous in hooking us up with a bunch of starts from her own small herb fram. A great blessing of late has been a true angle from Mt. Toby Friends Meeting is aiding us in our irigation-Mr. David Scott. Over the last few weeks he has brought over two well pumps that were contected to solar panels. The first pump “went caflooie,” and now the second one is in, hooked up to two car batteries and two solar collectors, and is working on and off. 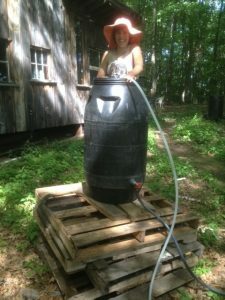 Once it is finally working we have a raised 55-gallon drum with a spigot, sitting near the well, running to other drums where there is a series of syphons set up. Thank God it rained last night! I have been trying to figure out how to post pictures but it is not working, so a bunch will be up soon. I forgot to mention some other very important things that happened while Alice was gone! While I was working with my dad, Jane and Kit Johnson stopped by on their way home from Greenfield. I told them how I’ve been looking around for a truck so I can go and fill it with compost. 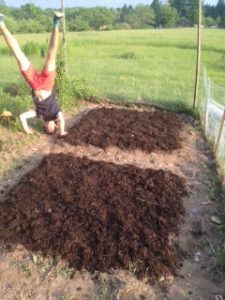 Somebody saw a message that went out through the Climate Action Now newsletter about the Bean Patch, and offered to donate some manure! Jane and Kit reserved their cohousing community’s truck for a day in North Amherst, we drove it out to Cummington, MA and loaded it up, then unloaded it back at the Hill. That was just so amazing how they gave a whole day to bringing me out there and all of the help they did. The woman who donated the manure was, the other Jane, Jane Crosby. Once out at her homestead, she helped load it up along with Martin, and Chris Mahar! (A friend of ours who lived with Alice this past semester at Hampshire College). It was very cool to see him. Just had to write about this because it was so fantastic. Since then Alice and I ordered an enormous pile of compost from Martin’s compost in Greenfield. It’s really great stuff. They are working with institutions, such as our very own Hampshire College, to disrupt the waste stream and reuse what can be reused! I highly recommend it for any sized garden or farm. I have been wanting to post for the past few weeks but have simply not had the time. I hope you understand. After finishing with school work at Hampshire College, myself and Alice moved up to Woolman Hill May 14th. A friend, Johnny Williams came and stayed a few nights and then I drove him and Alice to Logan Airport in Boston. We didn’t get much more work done other than setting up the tent and digging a fire pit, so I was left with a rototilled plot (that myself and Alice had done the week before), and some semi-prepared smaller gardens. The next two weeks while Alice was visiting home I was left to tend to The Bean Patch. I am so grateful for the help I received! My dad helped me early on to get half of the fence around the large garden up. It has 6″ chicken wire buried and 2’6” above, and then fishing line wrapped around hire up to deter the larger animals, with springy legs. They touch the invisible line and get spooked. Next my grandparents helped to hoe a bed and bring some supplies. Later that week my friends Will Harrison and Gabe Voisin helped me finish putting up the big fence. They were really great to have! And the next day Corey Winn, came bright and early! We worked all day, swam in the Deerfield River, and made dinner over the fire, and he spent the night. It was such a blessing to have Corey, he is a bright light! We weeded and layer compost manure. He even stayed until 11:30 the next day helping, when my friends Jaimon and Becky replaced him for a bit and aided in laying some compost and more weeding. Then the weekend past and monday my mom, her partner Jaye and my grandparents came to help plant. We put 87 tomato plants in the ground! And the next day I went to pick up Alice from the airport. Since then we planted so much more! About half of the large garden is planted. and compost on nearly all of the beds. I have to go now but will fill in more of this later. While Alice has been away visiting family, the farm has been able to run thanks to SO much support from family, and f/Friends. We just wanted to give a shout out of gratitude to everyone who has come to help in the last 9 days! We could not do it with out you. I – Alice- am so grateful to know that Dunan has recieved this much support in my absence and is not toughing it alone! Well, it’s been a slow start. We starting working on the land about a month ago, while trying to finish our finals at school. Now we’ve been living at The Bean Patch for about 2 weeks. We began during the semester by sheet mulching an old bed, last used by Juanita for subsistance. 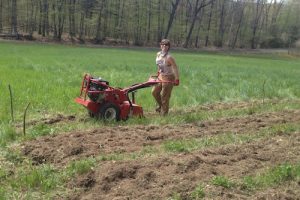 Then we roto tilled one large bed on the hillside that the Nelsons farmed for market. . . it had gone all to sod thus this was very hard work. This past week Dunan has been at the farm alone, while Alice is visting family. If you wanna come help out he will very much appriciate it- click the “Get Involved” tab to see how! This week has been fencing and more fencing- Woolman Hill experiances a lot of critter activity, and those that knew her tell us that Juanita was in a constant battle with the dear! Today the first plants went in the ground! Tomato starts that we grew in the greenhouses on campus are finally in the ground in our knewly fenced beds! Alice roto-tilling with a little sass.